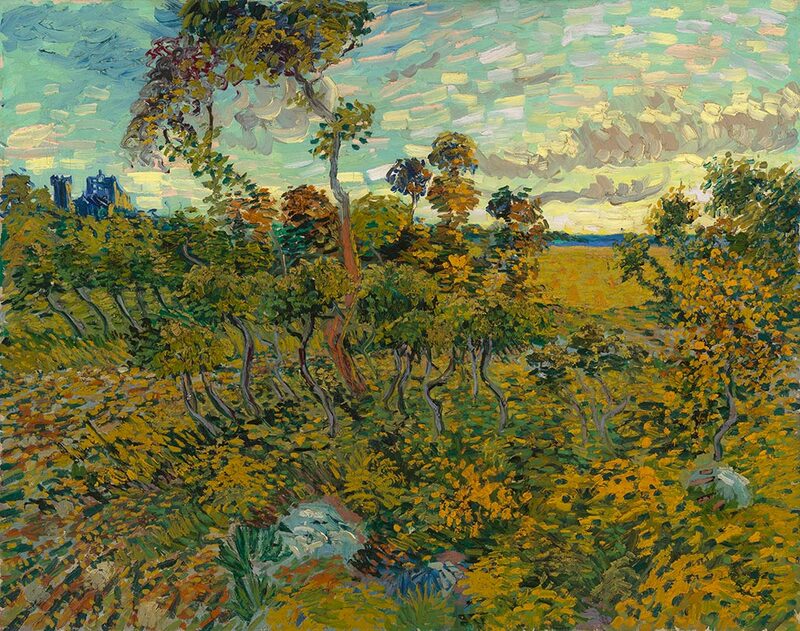 Though Van Gogh claimed to be ‘desperately dissatisfied’ with Sunset at Montmajour, he sent it to Paris in a dispatch to his brother, along with other paintings and drawings. These were almost like postcards, which he hoped would give Theo a ‘vague idea of the fine subjects of the countryside’. The painting, unveiled this month by the Van Gogh Museum in Amsterdam, had until recently been dismissed as a fake. However, after a rigorous inquest that lasted two years, Louis van Tilborgh and Teio Meedendorp, senior researchers at the Van Gogh Museum, concluded that it was an original piece by the artist, painted in 1888, during his stay in Arles, in the south of France. The artist wanted to capture the glow of sunset, but the painting appears somewhat clumsy and overworked. It isn’t one of the artist’s better pieces, but seen within the context of his experimental drawings, it tells an interesting story. 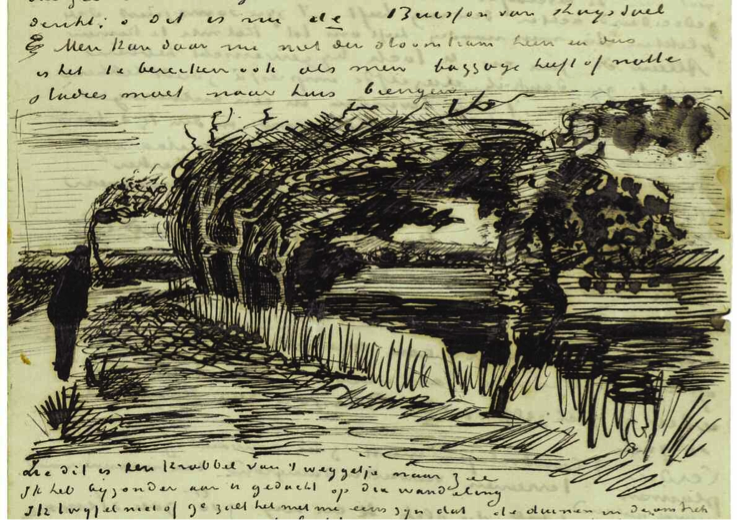 As Meedendorp, Tilborgh and Van Maanen show in a recent article for Burlington Magazine, Van Gogh’s perceived failure with Sunset at Montmajour led him to pursue a series of drawings that same week of the Arles landscape. The works that he produced over this period demonstrate a new stage in the artist’s complex relationship with nature. 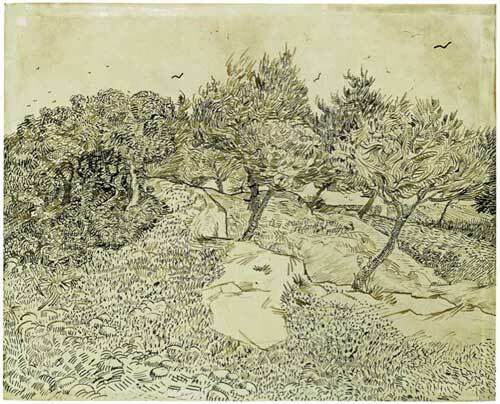 Five years before he arrived in Arles, in a letter to Theo from The Hague, the artist outlined his desire to capture the ‘virginity of nature’, which he illustrated with a sketch of the nearby beach. This drawing, a private message from the artist to his brother, depicts an intimate scene of solitude within nature. Its mysticism reveals an almost religious relationship to the landscape that persisted in Arles. La Bruyère, an early drawing after his arrival to the region, echoes Sunset at Montmajour in its busy execution. ‘The wild nature and bursting light in Arles exalted the artist,’ explains Jean-Pierre de Rycke, curator of the Musée des Beaux-Arts de Tournai. Through these informal sketches the artist appears to be exploring his new surroundings, for himself and for his brother. 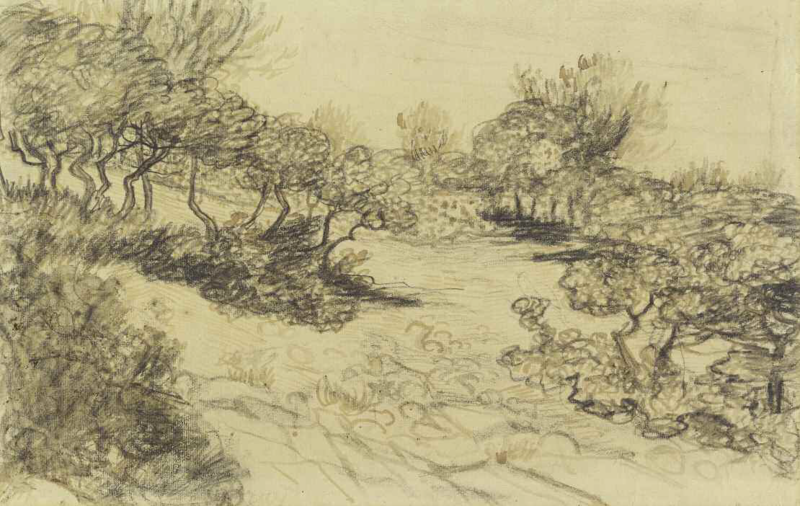 By contrast, Olive Trees, an ink drawing executed after the painting, shows the artist taking a new direction. The lines are a lot more forceful and confident, and though incredibly detailed, there is a newfound clarity to the image. De Rycke points to the ‘calligraphic’ quality of the drawing, which stems from the artist’s passion for Japanese prints. In light of these drawings, Sunset at Montmajour is more than just a bad painting: it is part of a string of untold stories. It reveals the artist’s struggle to portray nature and the importance he attached to it. Though dissatisfied with the painting, Sunset at Montmajour, like Path to the Beach, was sent as a private message to his brother, illustrating what he saw and felt in his new home. The disappearance of Sunset at Montmajour also tells the story of its original owner, the collector Christian Mustad. Like the artist himself, he appears as an emotional man, whose fear of failure at times overrode his judgement. Though he sought the advice of the director of the National Museum of Norway when he bought the painting, doubts were raised by a foreign visitor, which Meedendorp and Tilborgh speculate was Auguste Pellerin, the French Ambassador to Sweden and a well-known expert on 19th-century painting. After the consulate’s visit, in a brash act of shame, Mustad had the painting ‘banished’ to the attic. It remained untouched and forgotten for almost 100 years before its recent moment in the limelight. Tank you for this intresting article I loved it.